Note: This essay is me thinking aloud and it is not based on any formal theory of change. I would love to hear your feedback, and any pointers to recommended reading and research. There are many good arguments for why individual change alone is insufficient. There is no doubt that neoliberalism really has conned us into ‘fighting’ climate change as individuals. It’s the same old story of the Crying Indian, litterbugs, Keeping America Beautiful and any number of other examples of corporate co-optation. One can argue that Recycling too is a con job, designed to distract us from the much more important actions of Reducing and Reusing. Corporations go to great lengths to manipulate the conversation, injecting FUD and continuing business as usual. Not only is individual action insufficient – it can even be counterproductive. This is what happens when the energy we expend on individual change is energy away from organising, demanding and agitating for system change. Don’t wear yourself out doing individual things, when you could use that energy to win a big political battle. This is not to say that individual change is not important, it most certainly is. But it should not be the only change. System change is tricky, too. As a term, ‘system change’ is vague and quite neutral, which makes it too open to co-optation. Let’s look at an example: Lots of people going to climate marches today carry a sign stating ‘System change not climate change.’ Sounds good right, but what does is really mean? One interpretation is that it is demanding a change in the existing system – late stage capitalism – for example to be more ‘sustainable’ (a term that itself has been co-opted to the point that it has become meaningless). This is the capitalist’s favourite version, as it calls for a minor adjustment, which can be countered easily. For instance, if you convert a factory churning out 100,000 soft toys per a day to run on renewable energy, the system has been ‘changed’, and it is now a bit more ‘sustainable’ isn’t it? Job done. Another reading is that system change means a change from the current system to another system altogether – let’s call this system replacement. For instance, some are calling for a wholesale transition from late stage capitalism into ecosocialism. The current system does not like this, because the its number one goal is to uphold and grow itself. However, again, there is a within-system solution: reform. Unfortunately, reform is often only an illusion of change, one where the original power structures continue virtually uninterrupted behind the scenes. we are seeking to clarify the difference between changing a system (e.g., education or climate change) and The System (the entirety of the system we live within, for example the patriarchy or capitalism). A change from the existing system to another system – a system replacement. Late stage capitalism has mechanisms to subvert both demands. These mechanisms must be identified and countered to make change possible. System change, and system replacement, can only happen through collective efforts. Therefore, system change can only be instigated through the coordinated efforts of individuals. This diagram illustrates system change and system replacement. However, it does not consider the even more complex case of changing or replacing multiple intertwined systems together; something that could be called systems change or systems replacement, in plural. Change means changing the power balance, which requires energy. Status quo means maintaining the entrenched power unchanged. An individual can recognise the need for change, and make a change in their own life. However, without exemplifying or communicating this to their social groups – collectives – this will have very limited impact. For certain things, an individual can recognise the need but is prevented from making any immediate change in their own life towards that change. For instance, you can demand (more) nuclear power but the only way to achieve that is building collective and system change over time. Even though the diagram implies a hierarchy, it is really more like a network. For instance, separate collectives may be only loosely aligned but still agitate towards the same broader system change or replacement. Change is bidirectional: For instance, when an individual is pushing for a change in a collective, the collective will also impart change (and resistance) on the individual. The larger the scale, then more inertia and the higher the barrier to shift the status quo. This is indicated by the brick walls in the diagram. The dotted line and the remaining barrier between collective change and system change indicate that system change is partial. It also almost never ‘complete’ when measured against the original intent. Modern societal systems, by definition, are extremely large and complex. Therefore, they can only be shifted by the joint efforts of a large number of collectives. This diagram considers change as demanded by the less powerful (e.g. individual) of the more powerful (e.g. system). By definition, the system has a power advantage and can force change on collectives and individuals, often with little consultation or justification (e.g. increased authoritarianism or surveillance, decreased privacy, and so forth). 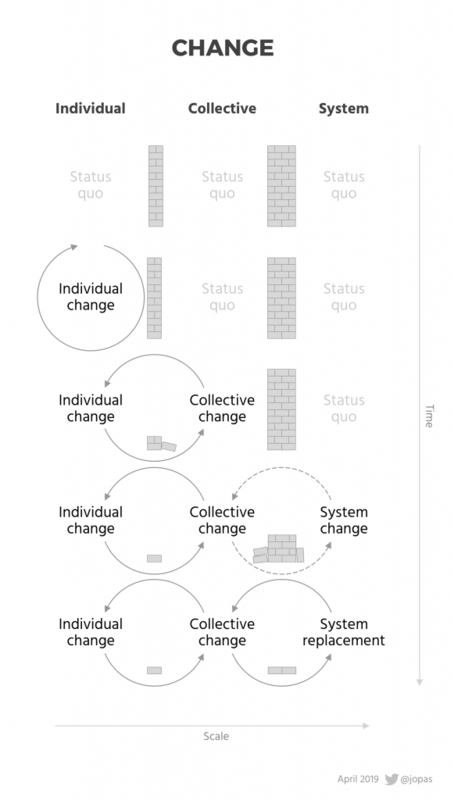 My core hypothesis here is this: There cannot be system change without individual and collective change first. Therefore, the choice is not binary but rather a journey that starts from individual change. Demand and instigate change in others (or not). With the right problem, understanding, circumstances and organising, you can become an active part of a collective. Your collective can align with other collectives, and together coordinate a push for system change or replacement. That said, most individual change or collective change will not lead to system change or replacement – the entrenched power is too strong. To break through the increasingly high barriers of inertia and proactive resistance by the system, collective change needs to be strategic, highly coordinated, multifaceted, and persistent over a long period of time. Only then can it become system change and, perhaps, system replacement. System change it possible when enough people share an understanding of a problem, have a similar view on what needs to change, and take a coordinated journey in the same direction. Thanks to everyone who reviewed versions of this essay.